Have you ever been frustrated trying to figure out how to make more sales of your products on Amazon? Have you ever had product detail pages just sit there, and hardly anyone buys the products? Would you like to be able to increase your product sales by 10% or 20% or 50% or possibly even double or triple or 5x your sales? Then today’s episode is for you! Find out which customer left a particular product review? UPDATE 11/8/17: Due to a recent Amazon change, this tool no longer works. Instead, I have added a tool to the list that lets you ethically spy on your competition by finding out what keywords their products rank for. Get dozens (or hundreds) of keyword suggestions for your products…real keywords that Amazon customers are actually searching? Learn the sales and pricing history of almost any product on Amazon? Find out instantly if Amazon owes you hundreds or even thousands of dollars in unpaid reimbursements for lost or damaged inventory? To generate organic, full-price sales on Amazon. What is an organic sale? One you didn’t have to pay for…someone found your product on their own, without you paying to put it in front of them or bringing them from outside Amazon, and they bought it. These are the sales that give you the best profit margins and with the lowest amount of effort. They do a search for it. They find it browsing through categories, or on lists or deals pages, like Hot New Deals, deal of the day, Lightning Deals. So How Do We Make More Organic Sales on Amazon? Give Amazon and customers as much information about your product as you possibly can. Persuade Amazon to put your product in front of as many customers as possible. To do this, you have to think like Amazon – Amazon shows customers the products they’re most likely to buy, so what will convince Amazon to show your product to customers? Consistently makes sales over time – a full price, organic sale is the best proof. When people search a particular term and see your product, they click on it – this shows the product is relevant to the search term. When customers look at your product detail page, a healthy percentage of them go on to actually purchase your product (use the Detail Page Sales and Traffic report to check this). To improve conversions, improve your images, bullet points, description, add video, etc. Your product has lots of positive reviews – customers like your product and are likely to have a good experience when they buy it and are less likely to return it. Your product is Prime-eligible – customers are far more likely to buy Prime-eligible products. To be Prime-eligible, your products must be fulfilled by Amazon (or Amazon has to have invited you to seller-fulfilled Prime). You, the seller, have good metrics and a high customer feedback score – you’re likely to take care of the customer and provide a good experience for them. Your brand is registered with Amazon – the customer is less likely to receive a counterfeit product. Brand Registry helps both Amazon and the customer trust your brand. Bring people from outside Amazon to buy your product…give them a special discount code. Use Sponsored Products campaigns to get your product in front of more people. Amazon starts showing your product to more customers, they buy they product, and this growing steady stream of sales provides proof of your product to Amazon…so they increase your search rankings and the sales snowball. 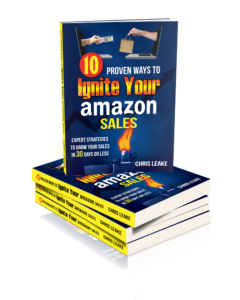 You drive a large amount of traffic from outside Amazon to Amazon, and they buy your product…Amazon loves this, because it brings them more buyers, and it also shows Amazon that a lot of people are willing to buy your product if given the opportunity. Amazon pushes your product near the top of search results for its main search terms…as long as the product continues to sell well in that search position, Amazon leaves it there and you are low generating a large amount of organic sales. Subscribe to the podcast through the iTunes podcast directory so you never miss an episode.